February is one of the most popular months in which to go skiing, with great snow conditions and of course the UK February half term holidays. 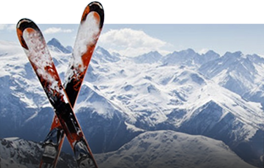 We've listed below some of our latest special offers for February ski holidays. Use the Search Availability button above to book now or call 0208 875 1957 to speak with one of our team. February is one of the most popular months in which to go skiing with generally fantastic snow conditions. We're taking bookings for February 2020, so get in touch today to secure your chalet holiday. Half term falls on the 16th February in 2020. Every year we sell out of nannies well in advance, so don't delay in booking your childcare. Find out more about what our nanny service involves. We accept children in all shared chalets on school holiday dates. We'd recommend Alpe D'Huez, Val d'Isere, Meribel and La Plagne for family holidays, as they all have excellent ski schools and plenty of activities beyond skiing to keep everyone entertained. Find out more about our family ski holidays. Offers are subject to availability, cannot be combined and apply to new bookings only. Terms and conditions apply. We have a number of special offers listed here but do let us know what you're looking for and we'll endeavor to provide a unique offer just for you. Call us today on 0208 875 1957.